NETWORK FINALS: THURSDAY NIGHT FOOTBALL adjusted to 4.3, down 0.4 from last week’s game. In addition, SUPERNATURAL gained 0.1 in final numbers. CABLE HIGHLIGHTS: NFL Network’s portion of THURSDAY NIGHT FOOTBALL was at 1.09, down a tenth from last week. USA’s PSYCH: THE MOVIE showed life in the veteran property at 0.51, with CHRISLEY KNOWS BEST serving as lead-in, up 0.05 from last week to 0.46. TNT’s NBA doubleheader was at 0.51/0.39. Univision’s LIGA soccer match was at 0.40. In cable news, it was another win for MSNBC’s RACHEL MADDOW SHOW at 0.36/0.52/2.9M, above Fox News’s HANNITY at 0.27/0.52/3.3M and CNN’s ANDERSON COOPER 360 at 0.23/0.30/1.1M. A&E’s THE FIRST 48 gained 0.03 to 0.35, and THE MENENDEZ MURDERS: ERIK TELLS ALL was at 0.20. On Bravo, TOP CHEF returned at 0.33, with lead-in MILLION DOLLAR LISTING down 0.03 to 0.29. On ID, BLOOD RELATIVES climbed 0.04 to 0.27, and STREET JUSTICE ticked down to 0.23. On Food Network, BEAT BOBBY FLAY shed a tick to 0.27, and CHOPPED was at 0.25. On We, TAMAR & VINCE rose 0.05 to 0.26. 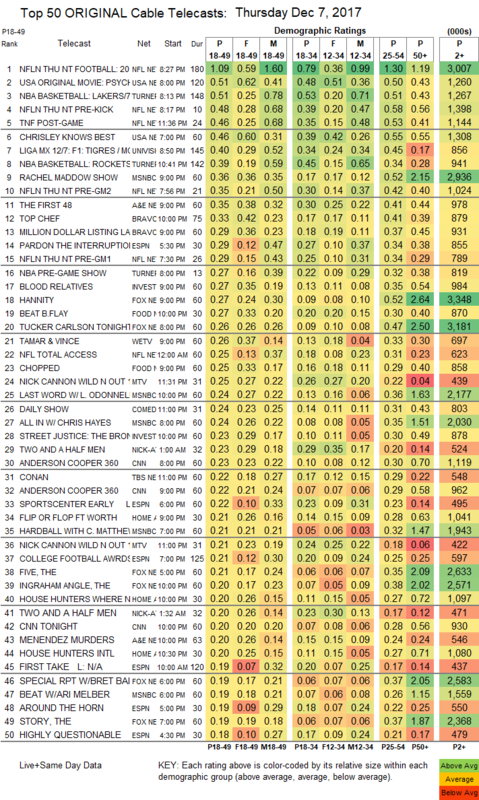 MTV’s WILD N OUT was at 0.25/0.21, compared to last week’s 0.23/0.23. On HGTV, FLIP OR FLOP fell 0.06 to 0.21, HOUSE HUNTERS lost 0.08 to 0.20, and HOUSE HUNTERS INTL was down 0.06 to 0.20. 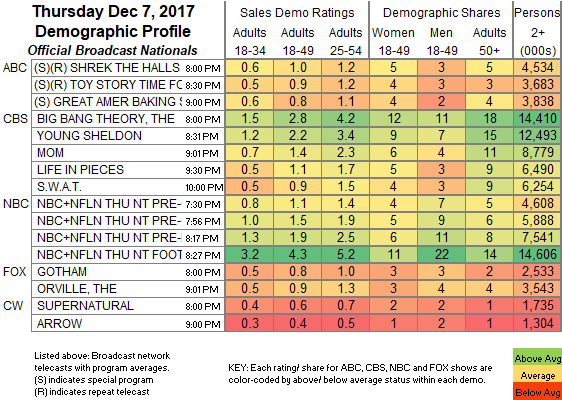 Tru’s THE CARBONARO EFFECT ticked down to 0.17. On Syfy, VAN HELSING climbed 0.04 to 0.14, and GHOST WARS was up 0.03 to 0.09. E!’s THE PLATINUM LIFE held at 0.07. POP’s IMPACT WRESTLING was off the chart, down 0.02 to 0.04/226K.